Ah, the magical Norma! This mare has long been a favourite of everyone who has seen her, including those lucky enough to be at the 2013 Polish National Championships where this wonderful mare took the Senior Female Championship and Best in Show. That weekend, Norma drew everyone’s attention and her classic Polish movement, coupled with her feminine looks, ensure that there wasn’t a dry eye in the house. By the time she had the Best in Show garland placed around her neck, Norma’s name as a world-class show mare was set. Sired by Gazal Al Shaqab (Anaza El Farid x Kajora), a stallion used to great effect at the Polish State Studs, Norma’s dam is Nina, a daughter of Monogramm (Negatraz x Monogramma) and out of WN Nastasea (Nabor x Kirkors Gazal). 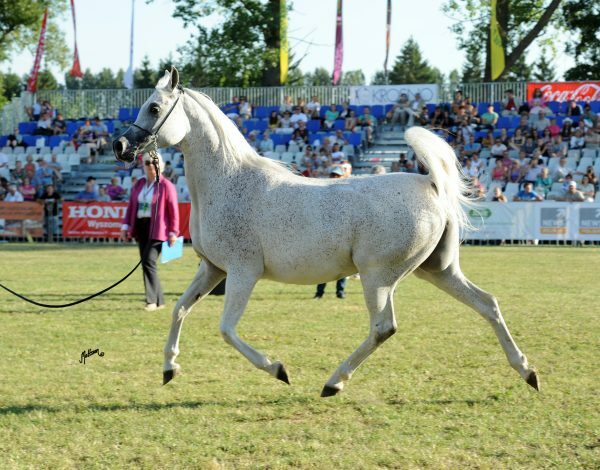 Bred at the Michalów State Stud, and foaled in 2004, Norma was entered in to the 2014 Pride of Poland Auction, and Al Muawd Stud in the Kingdom of Saudi Arabia were determined that she would join their show team. Since then, Norma has danced her way around the show-rings of Europe and the Middle East, winning legions of fans along the way. With her soft, graceful beauty, elegant looks, ground-covering movement, and her wonderful fleabitten coat, she turns heads where she goes, and catches the attention of the judges, too. In 2015, her first show with Al Muawd Stud, Norma was named Gold Senior Female Champion at the Qatar International Arabian Horse Show, beating two World Champions in the process. More accolades followed that year, winning her class at the Dubai International Arabian Horse Championships. Amid the thunderstorms of the Menton Mediterranean & Arab Countries Arabian Horse Championships that summer, Norma danced through the rain-soaked sand to win her class and later take the Silver Senior Female Championship title. At the UK International Arabian Horse Show, Norma also took Gold, showing off her stylish movement to huge applause. 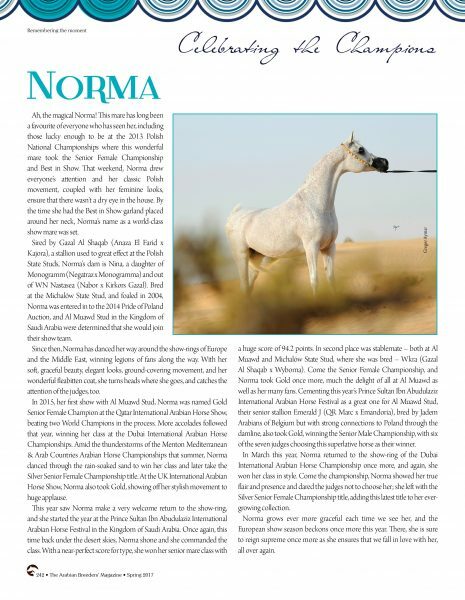 This year saw Norma make a very welcome return to the show-ring, and she started the year at the Prince Sultan Ibn Abudulaziz International Arabian Horse Festival in the Kingdom of Saudi Arabia. Once again, this time back under the desert skies, Norma shone and she commanded the class. With a near-perfect score for type, she won her senior mare class with a huge score of 94.2 points. In second place was stablemate – both at Al Muawd and Michalów State Stud, where she was bred – Wkra (Gazal Al Shaqab x Wyborna). Come the Senior Female Championship, and Norma took Gold once more, much the delight of all at Al Muawd as well as her many fans. Cementing this year’s Prince Sultan Ibn Abudulaziz International Arabian Horse Festival as a great one for Al Muawd Stud, their senior stallion Emerald J (QR Marc x Emandoria), bred by Jadem Arabians of Belgium but with strong connections to Poland through the damline, also took Gold, winning the Senior Male Championship, with six of the seven judges choosing this superlative horse as their winner. In March this year, Norma returned to the show-ring of the Dubai International Arabian Horse Championship once more, and again, she won her class in style. Come the championship, Norma showed her true flair and presence and dared the judges not to choose her; she left with the Silver Senior Female Championship title, adding this latest title to her ever-growing collection. Norma grows ever more graceful each time we see her, and the European show season beckons once more this year. There, she is sure to reign supreme once more as she ensures that we fall in love with her, all over again.